While you may have heard some buzz about the Celebrating Cultural Diversity festival you will want to read some of the facts that make it one of the most loved events in the greatest city in the nation! Read below for the top 8 reasons you don’t want to miss out on the fun and excitement at this great event! 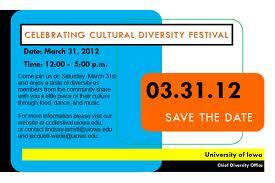 Celebrating Cultural Diversity Festival is an annual event that celebrates the different cultures that make up the University of Iowa and its surrounding communities. 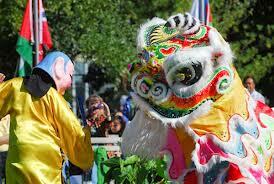 This year CCDF is celebrating its 23rd year of educating the community while honoring the many cultures in the area. Members of the community are invited to enjoy the fun atmosphere and learn about their peers through food, games, dance, music, literature, and much more. As an official Homecoming 2013 kick-off event, the CCDF will be held on Sunday, September 29 from 12-5pm at Hubbard Park near the Iowa Memorial Union. If it rains the CCDF will be moved to the Field House. Donâ€™t miss the special guest performer from Hancher, Martha Redbone’s Roots Project. This performance will enrich your cultural experience through Marthas award-winning blend of Native American elements with folk and Piedmont blues. Check out the Iowa State Fair also!